An outbreak of cholera in London in the 1850s killed over 10,000 people. The common theory was that the disease was spread through "bad air" and was therefore unstoppable. Thousands left their homes. A doctor named John Snow was skeptical, however. The disease was spreading but in seemingly random places. He studied maps of the city, overlaying a map of the city's water pumps with occurrences of cholera, and found that instances of the disease clustered around the sewage-contaminated Broad Street Pump. The city disconnected the water source, which effectively ended the outbreak. This led to the revelation that cholera is a water-borne disease. Maps are a powerful thing. Two maps working together? The sky's the limit. However, these researchers, and professionals in important industries like oil and gas or metals and mining, have historically faced two major problems. First, finding the right map was hard. Out of thousands of articles, how do you find the ones you need? Second, in order to compare two maps, they (the maps) needed to define their locations and resize them (called georeferencing). You cannot overlay a map of Africa over the city of Cairo and expect to get meaningful results unless the maps contain the correct coordinates and are to scale. Before computers, geologists had to painstakingly redraw maps in order to compare two or three of them. As technology advanced, geologists were able to overlay hundreds of maps, but they still had to georeference and scale each one, which could take anywhere from five minutes to five hours depending on the map. Imagine having to spell your words aloud before speaking them. 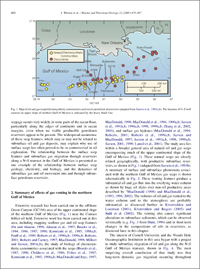 Geofacets, released in 2010, is an online tool that allows geologists to easily find and use maps from academic journals that are already georeferenced. Researchers can search maps in multiple ways, including by location, type of map or keyword. 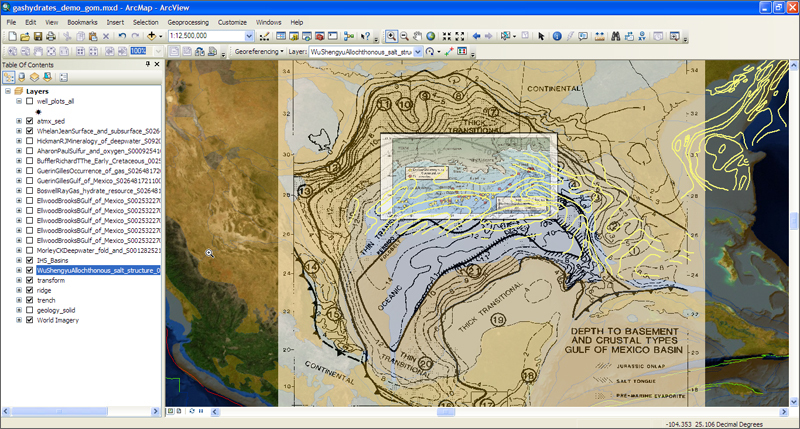 The maps can then be inserted directly into programs like Esri's ArcGIS, GoogleEarth, and various other GIS software programs. 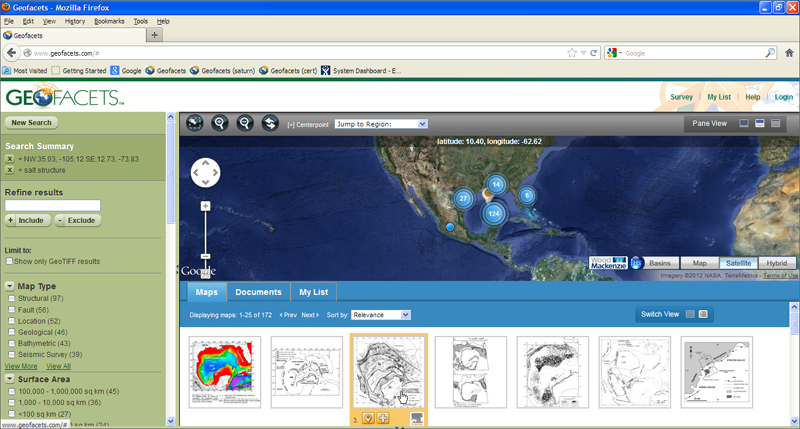 The tool was developed by a team at Elsevier that included geologists. They worked closely with geoscientists in the field before releasing Geofacets in 2010. All of a sudden, not only could geoscientists use maps immediately without having to reformat, rework or reconfigure them; they could actually find maps they would not have found before, buried in more than a century of scientific journals. This was a very big improvement, especially at oil companies, where drilling costs millions of dollars. "Geoscientists have to understand the different structural, geochemical and geophysical properties of rock formations, assess the source rock quality, the amount of pressure that is in the ground — and that's only the tip of the iceberg," said Phoebe McMellon, Senior Product Manager for Geofacets at Elsevier. "Exploration teams have to develop these insights in a limited amount of time, with a limited amount of data or and information of varying degrees of quality, that is aggregated from a plethora of sources." explained McMellon, who started her career as a geologist studying plate tectonics in New Zealand on a Fulbright scholarship. "In other words, exploration is a very expensive leap of faith, and geoscientists need maps from dozens of different sources to help put together pieces of a puzzle." But what were these sources? When Geofacets first launched, Elsevier had included the maps and data from its journals. But this only covered one third of the world's earth science journals content; there remained two thirds that geologists needed to access and use. "We were thinking about our business and how to evolve," said Friso Veenstra, Director of Market Development for Elsevier's Corporate Markets group and a geologist with a master's degree in marine geology. "And then we had this vision to work with people who were essentially our competitors and bring them together in one tool, for the benefit of our customers. Our journals weren't the only ones our customers wanted on the platform." By October 2011, Elsevier had collaborated with the Geological Society of London to add 35,000 maps to Geofacets to increase its total to 165,000. "What we do as geologists has little value unless we make that knowledge as available as possible," said Edmund Nickless, Executive Secretary of the Society, at the launch reception. "I would like to thank [Elsevier] for their forbearance, understanding and commitment." In September, Elsevier included 18,000 maps from the Society for Sedimentary Geology (SEPM), and Geofacets will continue to expand as more partner journal titles are included. Starting in January, Elsevier will collaborate with the Society of Economic Geologists (SEG) to incorporate maps from their journals with the aim of including more content for metals and mining exploration. And just last week, the Geological Society of America (GSA) signed on. "For customers, the tool is an investment that keeps increasing in value," said Regina Javier, Senior Product Marketing Manager for Geofacets. Today, there are over 225,000 maps total from Elsevier, the Geological Society of London and SEPM – and new maps are added on a regular basis from the included journal titles. With SEG and GSA coming on board, over 100,000 more maps would be added. Partnering with these societies underscores Elsevier's drive to accelerate geoscientists' discovery of hard-to-find scientific maps through Geofacets, supporting decision-making in a high-risk exploration environment. But after years of Elsevier and these geological societies selling their content separately, why are they teaming up now? It could be that Geofacets is just that useful for scientists. Dr. Howard Harper Jr., Executive Director of the Society for Sedimentary Geology, said it will help the society's journals gain exposure. "Working with Geofacets makes our publications much more accessible and applicable in the industry for scientific pursuits in general, which is a win-win situation for all concerned," he said in a press release. The Society of Economic Geologists' partnership is also expanding the scope of what Geofacets has to offer. "Collaborating with Elsevier to make our maps and information much easier to discover, and therefore easier to apply to their work, will help geoscientists combat specific industry challenges …," said Executive Director Dr. Brian Hoal in a statement. This collaboration particularly boosts Geofacets' ability to support those working in exploration, mineral resource appraisal, mining and metal extraction. "We see and hear excitement from our users in the metals and mining industry every time we mention the upcoming integration of SEG content into Geofacets," said McMellon. "By incorporating the unique content of such a renowned society as SEG, we are able to help Geofacets users discover critical, niche content that could otherwise remain buried in volumes and centuries' worth of publications." In these instances, Elsevier's size made it possible to develop a product that makes the high-quality content of these societies more accessible and useful to industry. "This product was the result of hundreds of interviews with geoscientists and dozens of sessions of user testing, millions in technology investments, and manpower," said Veenstra. "We were able to leverage our resources to start with a good set of content and technological capabilities." He pointed out that the collaborations are not acquisitions: "We are just trying to bring all relevant information to the forefront," he explained. "By adding content from other publishers, we are able to deliver a more powerful workflow tool that aggregates some of the most relevant content and high-quality content used by geoscientists working in upstream oil and gas exploration and the metals and mining industry." Sifting through centuries' worth of content, making individual maps discoverable, adding metadata – these are all things that take a full team of workers and strategic planning. Societies simply don't have the budget or the technological capability to build something this large. The Geofacets team still conducts user testing and interviews on an ongoing basis to gain feedback on the product and update it as needed. "Our team's philosophy is that Geofacets' content and functionality will continue to evolve as users' workflows and technology changes," said Javier. "Customer needs, beyond just content needs, inspire this product." 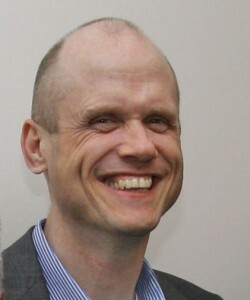 Dennis Lee is Manager of Corporate Relations at Elsevier. Previously, he worked as a business analyst in the office of the vice chairman and the company's Global Internal Communications group. He received a BA in English from Princeton University. Great storytelling. Terrific example of how we can lead our industry as both publisher and aggregator. Our customers in deep verticals receive tremendous value from unique solutions like this. Nice work, Geofacets team! What a wonderful contribution to science. The dissemination and sharing of results is at the core of science. I hope to see results in many fields that are made possible by this product and the collaboration (e.g., social and health sciences where mental and physical health puzzles have generally not yet sought answers tied to geology or geography). Kim - thanks so much for sharing your thoughts! Indeed, there are so many possibilities when one considers how to leverage technology in combination with science expertise and knowledge. It's about connecting the dots in the most meaningful and productive way. Keep in touch!